Does your preemie have eczema, allergies constipation or reflux? Maybe these are just things that you want to avoid? It’s never to late or too early to begin getting your preemie on the best track nutritionally. When my preemie was born I thought I knew a lot about nutrition and eating healthy, but our little girl showed me just how much I had to learn. My 32 weeker had intense reflux, constipation and apnea which made feedings a difficult chore. I began talking to doctors, nurses, and lactation consultants; not to mention hours of research on the internet. I started compiling together all of the research that I could. I wanted to learn how we could make feedings enjoyable, safe and nurturing to her little system. The more research I did the more I learned that preemies often have long term effects of the food that they are fed in their first couple of years. These include: allergies, type 2 diabetes, and leaky gut syndrome. I knew that if we wanted Bree to thrive, we had to fix the problem at the root of the issue. Here are the five tips for preemie nutrition that I have used to avoid allergies and make meal times nourishing and fun! Please keep in mind that every baby, and every family has different needs, so these might not all work for you; but I hope that you try some of them and that they benefit your family like they have mine. This may not be an option for you as breastfeeding can be such a struggle with premature infants, but if you can receive donor milk, or continue to nurse past the 12 month mark your baby’s system will have a great first start. We’ve all heard it breast milk is best, but did you know that breast milk can prevent allergies later on in life? Breast milk has been linked to preventing asthma, a common risk in preemies later on in life. Research also shows that breastfeeding your preemie gives them protection against diseases, in the early days. This boosts your child’s ability to deal with allergens that they may deal with later on in life. The longer a baby is breastfed the healthier, smarter and stronger they become. Here’s our story on the struggle of breastfeeding our preemie and some tips to encourage you along the way. Probiotics can be a really easy way to help strengthen and heal your preemie’s gut, preventing or healing them from allergies altogether. (Probiotics can even be found in infant formulas.) Babies with eczema, constipation, and other gut related issues have benefited greatly from a daily probiotic. When a baby is born naturally they are given all of the mom’s gut flora in birth, however, for most of us preemie mom’s we were on antibiotics during delivery which strip the gut entirely for both mom and baby. Thus, making this a great first step in helping their underdeveloped digestive systems. Once we began giving our preemie a daily probiotic her constipation and reflux disappeared completely! Hospitals in New Zealand and Australia are giving preemies a probiotic as soon as they are admitted and the findings are incredible! While it may look healthy, your little preemie’s tummy may not be ready to break down all of the synthetic ingredients. As our nutritionist wonderfully put it, “It’s like giving your baby a carne asada burrito. It puts your baby to sleep and helps them gain weight, but isn’t nutritionally beneficial.” We began with real foods first that were easy to digest. These included: Avocado, banana, and egg yolks. These foods helped get her acclimated to table foods without causing major constipation and discomfort for our preemie. This is a great article to give you some ideas for real foods for your baby. Note: Before making any dietary changes, be sure to seek the advice of your baby’s pediatrician or nutritionist. This is so crucial to your little one’s weight gain, especially if you’re trying to avoid processed foods for your little one! Healthy fats will help your baby gain weight in a safe and steady manner. An incredibly great fat for your preemie is organic, unrefined coconut oil. I seriously love this stuff! Studies have shown that preemies massaged with coconut oil gain weight faster, verses using other oils. It is full of DHA, a fat that stimulates healthy weight gain and is the primary fatty acid in the brain. This means that your preemie will not only thrive physically but also mentally. I love sneaking coconut oil into our preemie’s smoothies, eggs- you name it and she has it with pretty much all of her meals. Coconut oil has medium chain fatty acids, making it easier for your preemie to break down the fat and have the fat be used by the body sooner! While feedings can seem daunting now, have hope! Your preemie will be strong, healthy, and eating the same stuff you do before long! Remember how much you and your preemie have overcome! Every baby and every family is going to be different. 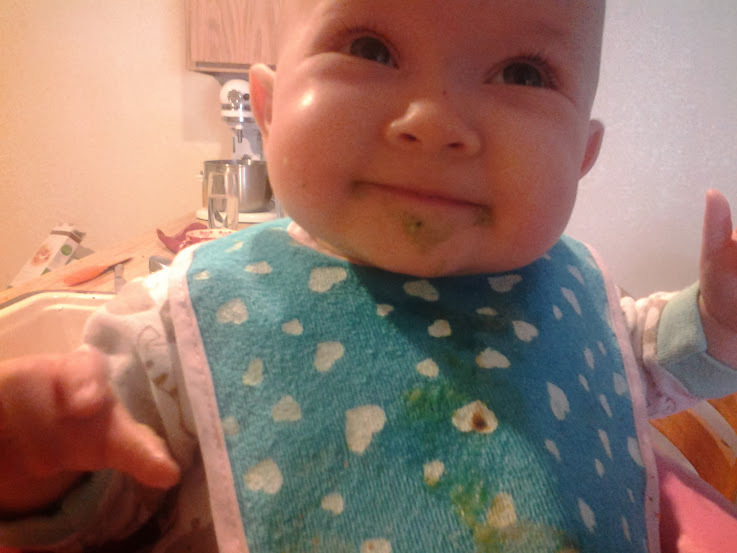 Some days my preemie had avocados with no problems, other days she had severe constipation. Be willing to be flexible and try new things. As always check with your doctor and nutritionist and keep an open dialogue. One thing that we found difficult was finding a doctor that supported us in avoiding processed foods for our preemie. Finding a great doctor that you can work with is so crucial for you and your preemie. Enjoy finding ways to help your baby grow big and strong! We have a 10 week old Preemie that has been placed on Gerber oatmeal cereal for reflux and “diagnosed” with a milk protein allergy. I went dairy free for 30 days and his eosinophil levels remained high. He was still on Gerber oatmeal. The only symptom he had was reflux. No bloody stool or anything. I am still pumping and my gut says to nurse him and give him a probiotic. What kind of probiotic did you use and at what age?